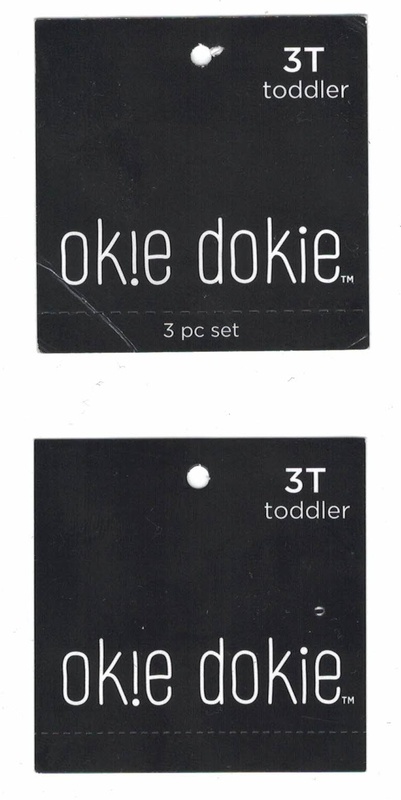 Today we have a children's hang tag from the JC Penny house brand "Ok!e Dokie." I'll be calling it Okie Dokie from here on out, because I'm not a masochist and like to type actual words, but the play on the upside down "i" into an exclamation point is actually somewhat well done. 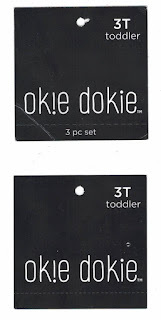 It hits the kids theme (because we all know kids and backwards letters go together, a la Toys "R" Us) and uses standard punctuation. 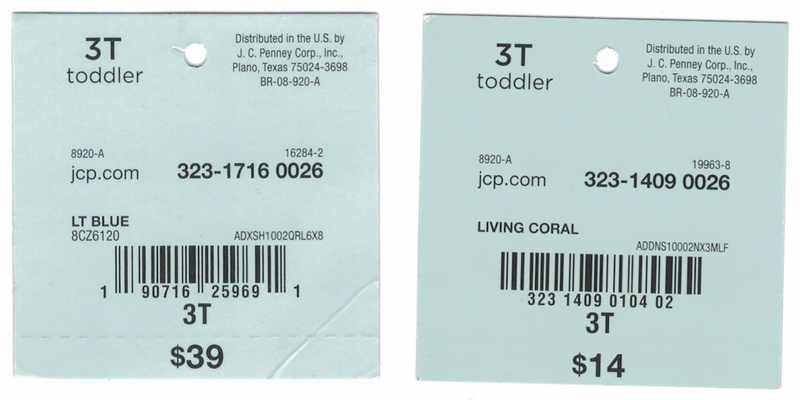 I noticed that the word mark is listed only with a TM, so I checked the register and found a couple that have existed for some time, but all seem to either be dead or cancelled. I'd love to get the story, but in any case, there is no active registration for this tag. The front is no nonsense - a solid navy with the name and the size, plus a tear-away at the bottom. The tear away, interestingly enough, is both a gift receipt and a multiple piece indicator. I haven't noticed this yet, but it works - it stands to reason that if you aren't going to sell them as a set, you probably won't use the manufacturer's suggested price either, so might as well remove both. The reverse is typical discount house brand fare - 100% factual information in a machine readable format. The reverse's odd blue color sure is rough on the eyes, but the layout of the information is commendable. There is a lot packed onto the tag, but it isn't overwhelming. It may not be beautiful, but functional it is. 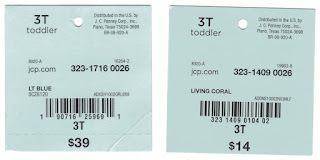 It is worth pointing out the color of the one tag, "Living Coral." Say what you want about the health of our earth and the role each of us plays in being aware of our actions and their impact on it, I would never think to see it called out on a discount, mass market, clothing hang tag. I guess "Dead Coral" or "Bleached Coral" don't have the same appeal, but what, really, is living color? The color "coral" is generally understood to be a variation of orange, but if you use the distinction "Living" it must be a reference to the actual plant/animal/rock that lives in ocean reefs. As such, the color of such life ranges from blues, to yellows, to reds, to browns, to greens, and, I'm sure, the eponymous orange. In any case, these tags are certainly not high on my list. The trademark mystery is somewhat exciting, but overall, these are function above all else.